Abstract: The particle diameters of CdS quantum dots (QDs) affect the optical properties such as absorbance and photoluminescence. In general, CdS QDs are synthesized at high temperature because of nucleation and the particle sizes of QDs can be controlled by changing heating duration . 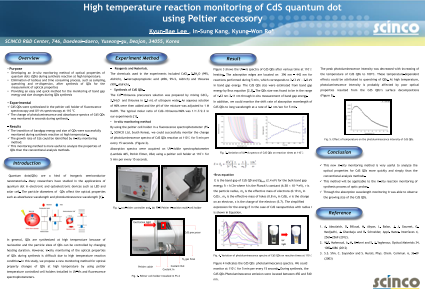 However, in-situ monitoring of the optical properties of QDs during synthesis reaction was difficult due to high temperature reaction condition. In this study, we propose a new monitoring method of optical properties of QDs at high temperature by using peltier cell holders installed in UV-Vis and fluorescence spectrophotometers. This method eliminates tedious and time consuming process, such as sampling, quenching and re-dispersion, after synthesis of QDs for the measurement of optical properties. By using the peltier cell holder in a fluorescence spectrophotometer (FS-2, SCINCO Ltd, South Korea), we could successfully monitor the change of photoluminescence spectra of CdS QDs in seconds at high reaction temperature (110℃) (Figure 1). In addition, we could find the shift of absorption wavelength of CdS QDs to long wavelength at a rate of 0.1 nm/sec for 5 min in a peltier cell holder of UV-Vis Spectrophotometer (Lambda 465, Perkin Elmer, USA) (Figure 2). Absorbance can be converted to band gap energy and this band gap energy is used to estimate the size of CdS QDs by Brus equation [2,3]. We found that band gap energy increased to 2.8 eV from 3.13 eV and CdS QDs grew to 2.11 nm from 1.63 nm from absorbance spectra acquired through in-situ measurement (Figure 3). In conclusion, this new in-situ monitoring method is very useful to analyze the optical properties for QDs more quickly and simply than the conventional analysis methods and will be applicable to the in-situ reaction monitoring of synthesis process of optic probes.Summary: 1. This new in-situ monitoring method is very useful to analyze the optical properties for CdS QDs more quickly and simply than the conventional analysis methods. 2. This method will be applicable to the in-situ reaction monitoring of synthesis process of optic probes. 3. Through the absorption wavelength monitoring it was able to observe the growing size of the CdS QDs. References: 1. A. Aboulaich, D. Billaud, M. Abyan, L. Balan, J. J. Gaumet, G. Medjadhi, J. Ghanbaja and R. Schneider, Appl. Mater. Interfaces 4, 2561−2569 (2012).